YOU HOLD THE KEY !! 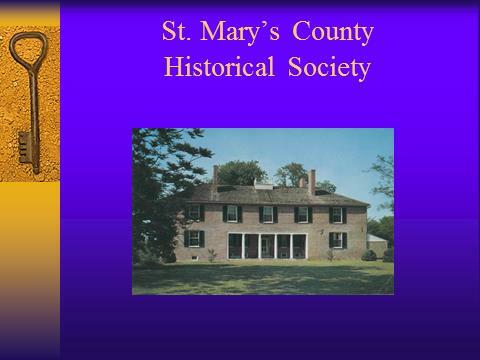 The St. Mary’s County Historical Society (SMCHS) relies upon a variety of support to carry out its mission to preserve, research, and interpret the history of St. Mary’s County, Maryland. You can provide support for the Society and its programs through membership, the Annual Appeal, contributing to or creating an endowment fund, supporting our various fundraising events, or by remembering the SMCHS in your estate planning. Its collections, with a focus on the county’s people, places and events are held in trust for the use and education of the public. This information is made available at the Research Center maintained by SMCHS through its Archives, and through its publications such as The Chronicles of St. Mary’s, as well as through programs and exhibits. SMCHS also provides stewardship of 18th century Tudor Hall, which functions as its main facility, as well as the Old Jail. Write a check, use PayPal, or charge a credit card. Each fall, membership renewal notices are sent to existing members. New members are solicited at any time. Fall: Dues notices sent to all members. Give a gift in memory or in honor of a loved one or a friend. Anytime: Realize tax benefits for your kindness. Name rooms and/or furnishings in Tudor Hall in memory or honor of a loved one, friend, etc. Give securities owned longer than one year, and receive a deduction and avoid capital gains tax. Anytime: Consider this gift whenever long-term capital gains taxes are an issue. Establish a fund to support a specific interest, leaving the principal intact in perpetuity. Anytime: Gain a tax advantage and create a permanent and financially stable fund. Name SMCHS owner and beneficiary of a life insurance policy. Anytime: Make a significant gift from income instead of capital while qualifying for an income tax deduction. Make a donation and, in turn, receive a fixed annuity payment each year for life. Anytime: Benefit from a current tax deduction and augment potential retirement income on a tax-favored basis. Designate all or a portion of your retirement plan to SMCHS while retaining control and use of the funds during your lifetime. Anytime: Give the most-taxed asset in your estate to SMCHS, leaving more favorably taxed property to your heirs. Name SMCHS as primary or contingent beneficiary of part or all of your retirement plan. Anytime: This tax-heavy asset makes a great charitable gift after your lifetime. If you wish to make a planned gift, we urge you to meet with your attorney, financial advisor, or estate-planning professional to discuss your options. If you would like further information on ways to give, please contact Christine Senese, SMCHS Treasurer, at 301-475-8966, ext. 11, or email her at csenese@md.metrocast.net.